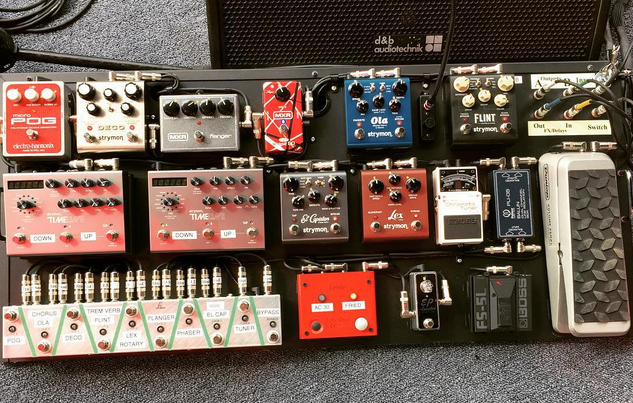 I’ve been watching the evolution of Chris Shiflett (Foo Fighters) board change over the years. I first brought up his board on their Austin City Limits performance in 2011 and the time I got to the meet the band a few months later. While watching their Sonic Highways show on HBO, I also got a glimpse of his board and wrote about it at Pedal Finder. Just like you would expect, his board is continually changing. From 2011 to Sonic Highways (2014), the board has changed, but not too drastically. Let me know what you think by commenting below!! Guess he relies on amps completely for dirt? I don’t think that’s an Xotic EP booster but the SP compressor instead. I agree with Adam. Pretty sure it’s the SP compressor. About the only other pedal he needs on that board is a pedal that’ll splint, set and cast a broken limb (word is that Chris had a bandmate in occasional need of a pedal with that capability). eBay the looks of his dials he starts with everything straight up and tweaks from there. He sure likes Strymon, not that I blame him!